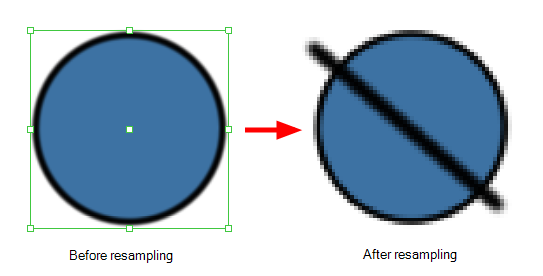 Since bitmap artwork is stored as color information for each pixel, scaling your artwork requires Harmony to resample it. This means that if you scale up your artwork, it is liable to lose picture quality. Furthermore, since Toon Boom bitmaps are embedded in a rectangular canvas, you cannot select a part of your bitmap with the Select tool to transform it. With Toon Boom bitmaps, the Select tool is only able to select the entire canvas. If you want to transform a part of your bitmap drawing, you must use the Cutter tool to cut out the part you wish to manipulate. However, artwork that you manipulate is not immediately resampled. This is to make sure you can manipulate your artwork in multiple steps before it is merged into your artwork again, allowing to preserve as much of its quality as possible. While manipulating your artwork, it temporarily becomes an object that is separate from your bitmap canvas. Then, it is merged back into your canvas and resampled to match its pixel density when you perform your next drawing operation on it.